After training to trek up to Everest Base Camp in Nepal, buying any extra kit and mentally preparing, I was super excited to get going. So why did I wind up in a hospital in Kathmandu on day four? 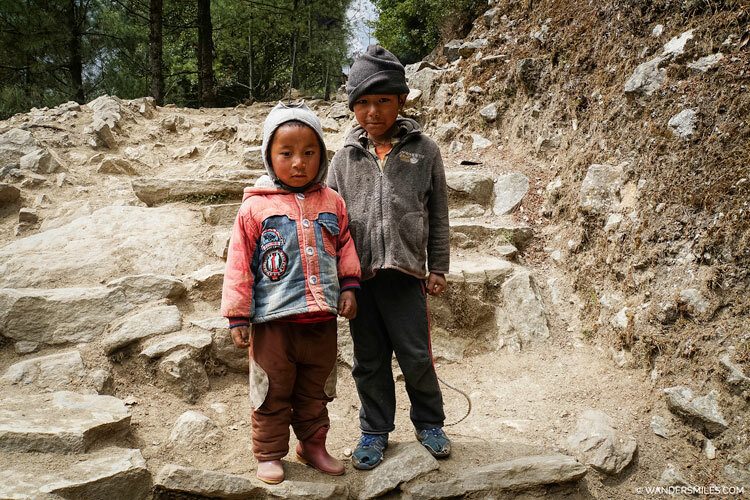 Here’s my journey from Lukla to Tengboche and why I didn’t reach Everest Base Camp this time! 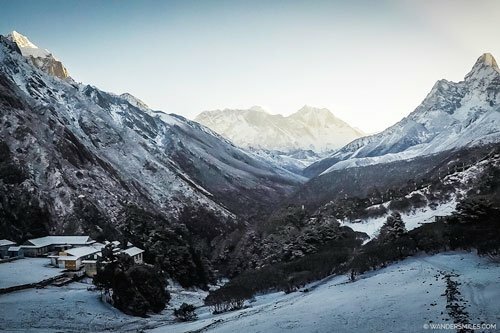 The trekking to Everest Base Camp with Trekkup Dubai started after landing in Tenzing-Hillary Airport (Lukla), the gateway village of the Everest region. 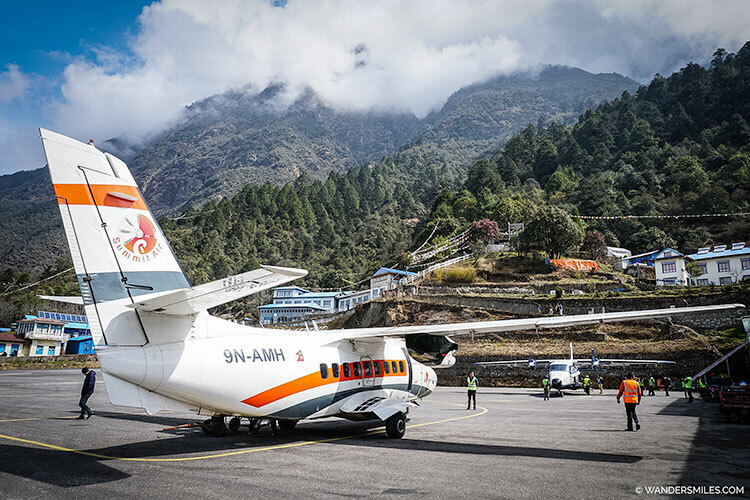 There was a change of schedule as domestic flights from Kathmandu to Lukla have been cancelled, Kathmandu airport’s only runway is to be resurfaced. As Kathmandu Airport will be closed from April 1st to June 30th 2019 between 10pm and 8am, flights are leaving from Ramechhap airport instead which is a good 4 hour drive from Kathmandu. 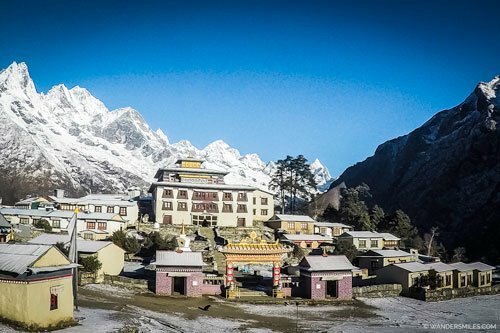 This is just perfect timing for the peak hiking season in the Khumbu region… NOT! Ramechhap is a tiny airport surviving on organised chaos. Our flight to Lukla was a mere 20 minutes and a pretty smooth, precise landing which I wasn’t expecting. I’d heard that if the pilot fails to break in time when landing, you could quite possibly crash into the mountain. For take off, if you don’t make it into the air in time you’ll fall down a mountainside instead. 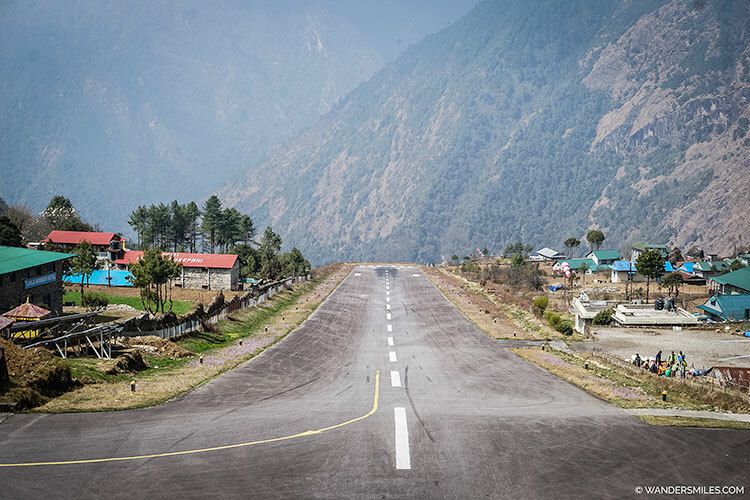 I’d decided not to watch the YouTube videos before I left but you can see why Lukla has been hailed as the most dangerous airport in the world with its short stretch of tarmac perched on a steep cliff. Only a week after our flight, a plane crashed into 2 parked helicopters causing 3 deaths and injured 5 people. Tragic! And off we go on our big adventure. 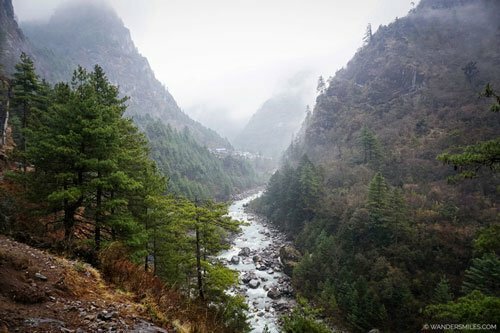 We ventured past the shops in Lukla and our guide organised the permits for Sagarmāthā National Park. We were blessed with ideal weather conditions; fresh with a touch of sunshine. 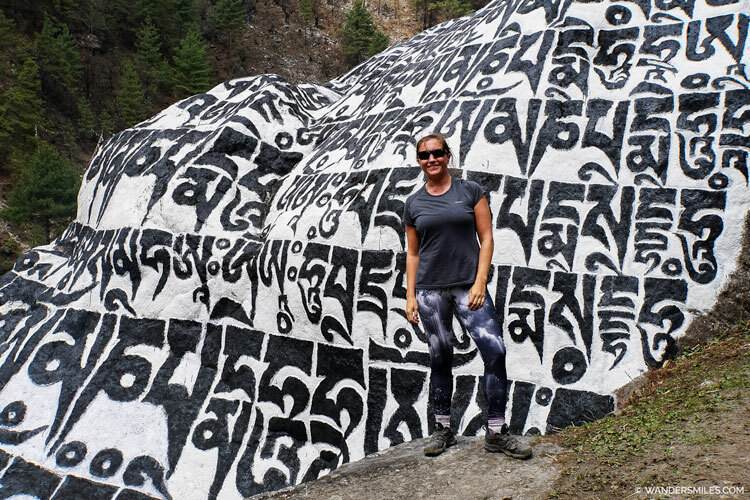 Along the trail you find varying sizes of prayer wheels inscribed with om mani padme hum mantras along the way. By turning the prayer wheels clockwise, it is believed that the mantras inside are activated and released. The mantras are said to purify negativity and generate compassion. 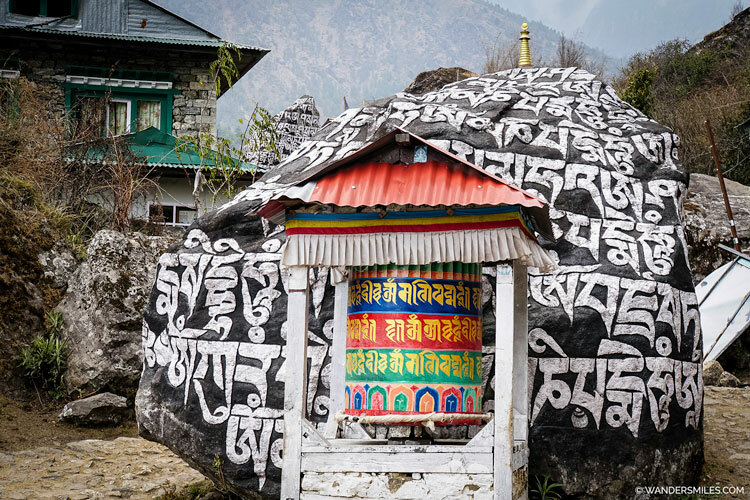 Mani stones feature heavily on the trek too, they are carved into the rock and painted with the inscription mantra. 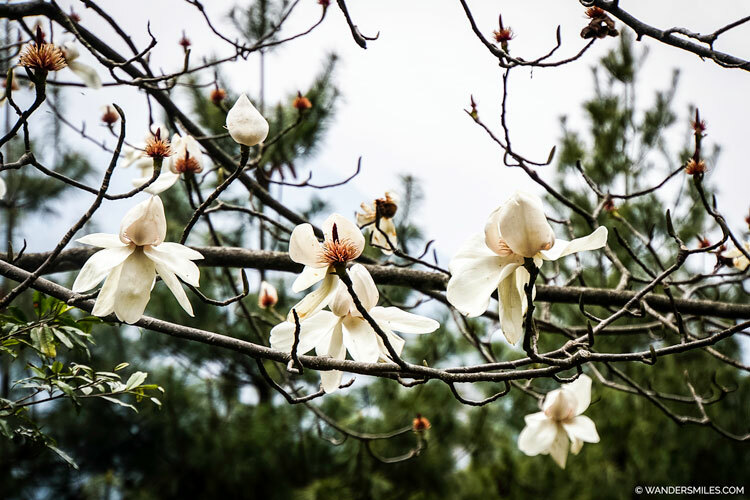 The huge white Magnolia and red Rhododendron trees are a beautiful sight and but the Cherry Blossom trees in full bloom are a sure sign that spring has sprung. A large proportion of lodges contained the word ‘Sherpa’ and ours in Phakding fell into that category. 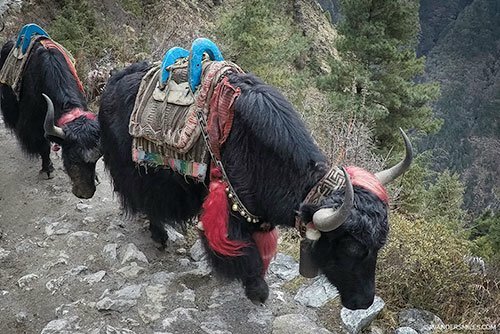 The owner had summited Everest 3 times as well as a long list of conquered peaks. After the earthquake, he built his lodge and is booked up months in advance. I love a good success story! The fire in the lodge to boil the huge kettle was a god send. I was happy to get my trekking shoes off. For the first time ever, they had started to rub and was hobbling around. Maybe a good rest overnight would help. Looking out the window at breakfast, I could see the moody clouds above. Rain was on the way! 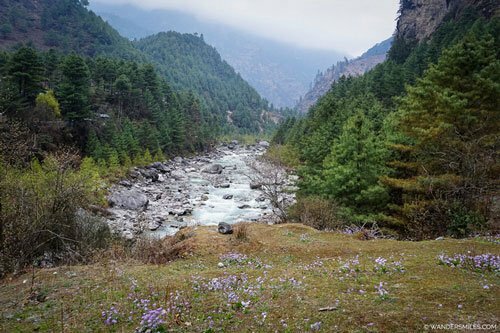 You’ll find yourself crossing over the Dudh Kosi River and trekking along the undulating path on the west bank through the villages of Tok-Tok (2,760m) and Benkar (2600m) where we crossed the river again. The water was super clean and the turquoise colour reminded me of the rivers leading to Iskanderkul, a mountain lake of glacial origin in Tajikistan. Our next stop was Monjo (2,835m), the entrance of the Sagarmatha National Park. Sagarmatha is the Nepalese word for Mount Everest. 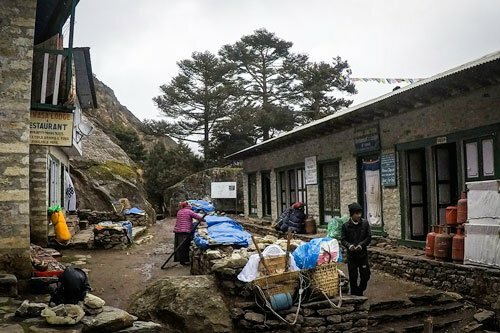 This is the place where the the TIMS (Trekkers’ Information Management Systems) card are bought. 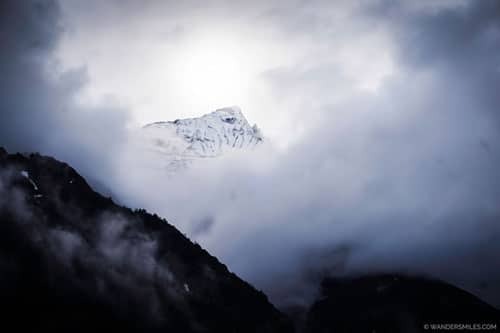 This is mandatory to ensure the safety of the trekkers and aims to control illegal trekking operations. We hid from the rain under a shelter whilst our guide sorted the cards for the group. Stopped for lunch to re-energise in Jorsalle (2,740m), it was great to take the weight off my foot that had really started to hurt more as the morning continued. 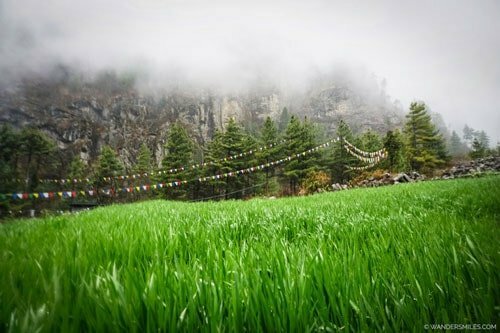 Mind over matter, let’s crack on with this steep incline for the afternoon trek to Namche! We crossed the biggest and most shaky suspension bridge on the whole trail then the predictions were right, this next part was definitely what I would call ‘uphill’. As we passed a lady of 79 doing the trek, I decided I should not moan about my foot which was getting progressively more painful. However, I do remember in Kilimanjaro we were told to walk pole pole (slowly, slowly in Swahili) so I checked in with our guide for the Nepali version, we continued in a bstari bstari pace. OK, I was in pain! 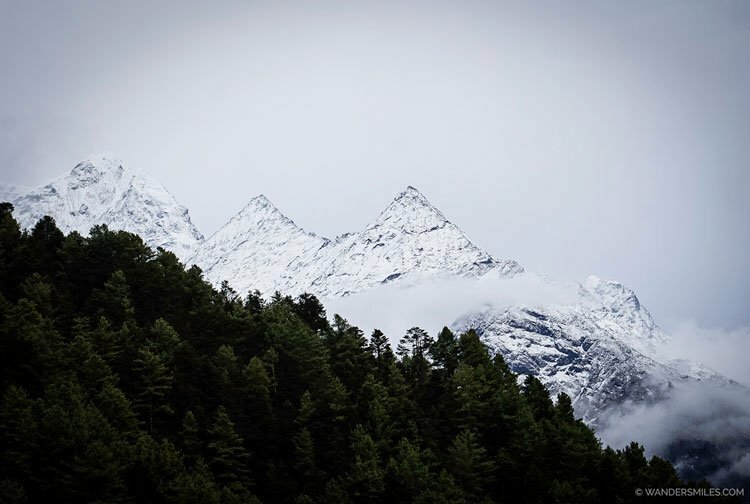 As we neared Namche, we had some epic views of snow-capped Kongde Ri, one of the sacred mountains in Khumbu. 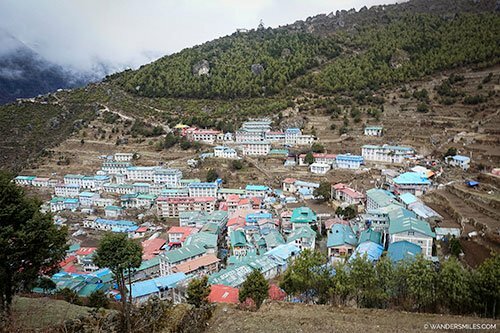 I was more than delighted to have reached Namche, a prosperous market town selling everything from Tibetan artefacts to trekking and climbing equipment. The first thing I did before reaching the hotel was to buy some flip-flops and get my shoe off, the pain had ramped up at a fast pace. I went to the pharmacy, the doctor was not working as it was a holy day so I bought the antibiotics that the lady advised. The doctor in our group cleaned the wound on my toe, bandaged it and told me the antibiotics I had bought were not the right thing… fantastic! OK, now I’m really in pain! On awakening, I could feel things had taken a turn for the worst, my foot had swollen up, how was I going to walk? I hobbled over to the Sherpa shop to buy some big shoes (sounds ridiculous now I think about it) but the pain of getting them on, attempting to walk in the them and taking them off brought serious tears to my eyes. The helpful vendor sold me some downy boots and rang round Namche for a horse to take me to Tengboche. The rest of my group headed on their way as I had a coffee, waited for Astari the horse to be saddled up and handed over the grand sum of 150 USD for the service. I was sporting a trekking shoe on the left and a downy boot over the bandaged foot wrapped in a plastic bag to avoid it getting wet, attractive! The terrain was a lot of descent to start with and I was racked with guilt as Astari had many stand-offs. I felt terrible putting this lovely animal through this although I’m probably lighter than some of the loads I’ve seen the horses carrying, still no excuse! 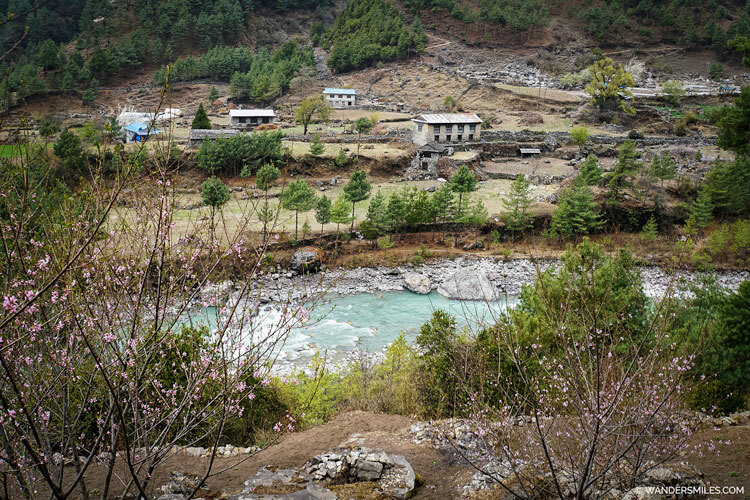 We stopped by the river at Phunki Tenga, the horse was fed from a soccer ball cut in half and I enjoyed Tibetan bread with tomato and garlic soup. 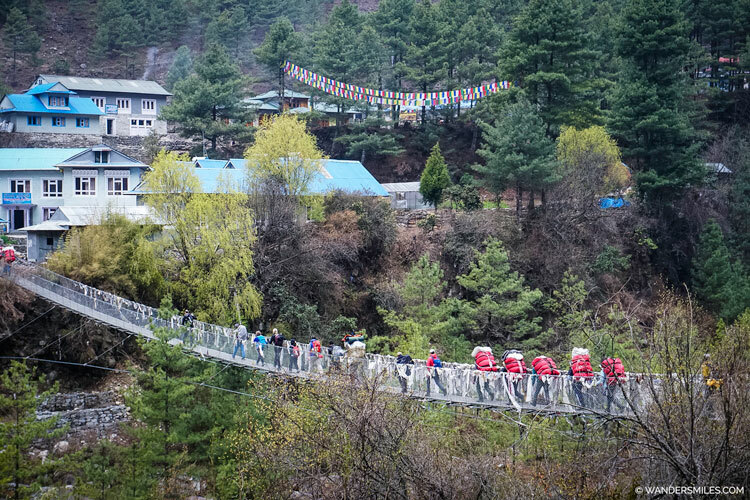 After lunch, our next manoeuvre of riding horseback on a suspension bridge was a little nerve-wracking, I was hoping the fact they were wrapped in prayer flags would help me safely to the other side. Now we’re ready for 2 hours of steep incline which I was told the horse would be happier with, not sure he was. 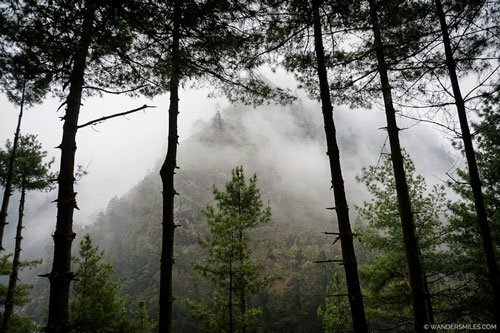 The weather was a sea of mist in front of you as we arrived at Tengeboche. Hot chocolate please! I was kindly offered medical help by a guy who’d seen me on the horse (actually I was holding them back) with my dodgy foot, turns out he’s one of a group of 23 Aussie paramedics and nurses trekking to raise cash for Queensland Ambulance Service Legacy Scheme. The doctor in our group took a look at my wound under the dressing and with a worried look in her face, diagnosed as having Cellulitis. I had no clue what Cellulitis was. I was told it needs antibiotics and clean bandages, not the dirty socks i have in my duffel bag. If Cellulitis goes untreated, this can result in loss of limbs or even worse. So time to call on the Aussie medics who were more than happy to assist with advice and some antibiotics for the next 3 days, what an awesome crew! Woke up to blue skies and settled snow on the ground. The sun was shining on the white peaks all around. 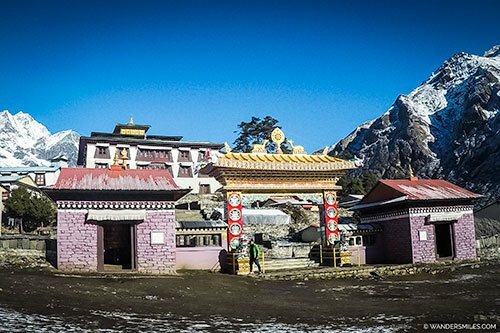 The bright colours of the Tengboche Monastery, also known as Dawa Choling Gompa, were a striking contrast to the wintery backdrop of Mount Ama Dablam. 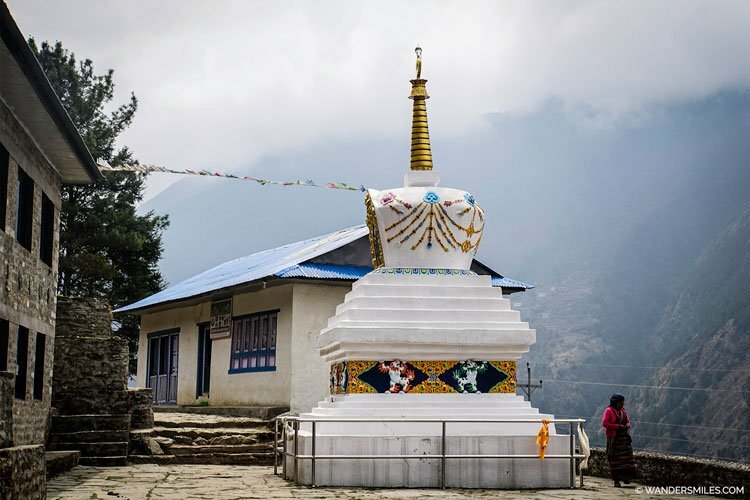 This Tibetan Buddhist monastery of the Sherpa community was built in 1916 by Lama Gulu and has been affected by earthquakes but after the fire in 1989 it was replaced with a more solid structure. As beautiful as my surroundings were my foot was more swollen and I had to make a call… I couldn’t walk so do I hire a horse and hope the antibiotics will kick in? I only had Augmentin for 3 days to get me to Base Camp but then what about the following 2 days before we reach Kathmandu? I was told I really needed to get Flucloxacillin to treat Cellulitis. Do I risk it? But I still can’t walk to Everest Base Camp? Then my sensible head rules over my yearning to complete the challenge and I remembered the possible loss of toe and being more susceptible to frostbite with an open wound, I started leaning towards getting to a hospital as quick as possible and get proper care. I wanted to keep my toes, end of story! I handed over my World Nomads insurance certificate to our guide to organise the helicopter evacuation. On arrival in Kathmandu airport, I was taken by ambulance to Era Hospital. It was a little dramatic with the sirens going off although they were put on hold as a call came through on the drivers mobile! I spent 2 days being treated with antibiotics and the dressing changed twice a day and was happy to be discharged to a much cleaner hotel. So this situation taught me NEVER to go without travel insurance, I’d have been up the proverbially **** creek without a paddle had I not have taken out the right insurance with World Nomads. It’s designed for adventurous travellers with cover for overseas medical, evacuation, baggage and a range of adventure sports and activities. 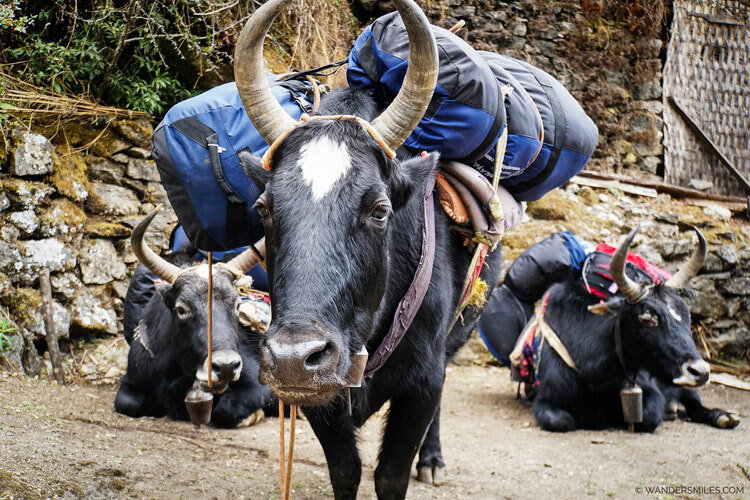 They cover up to 6000m altitude for trekking on a standard route, however, please note that for emergency evacuation in Nepal, there is an excess of 725 USD to pay. 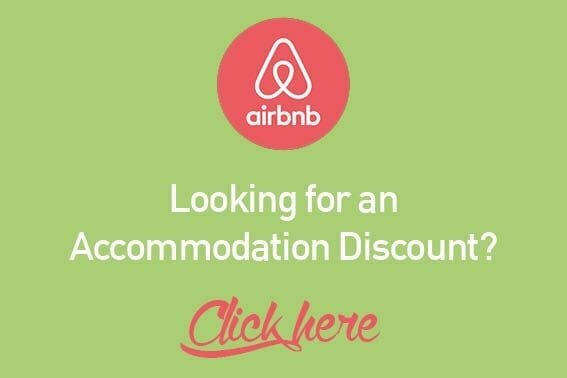 You can buy and claim online, even after you’ve left home but with a trip like this it’s best to have this on your list of things to do before you go. Remember it’s all about safety on the mountain! If you want to get your heart racing, rappelling down a 45m waterfall at Lwang Ghalel by Kakski in Nepal should do the trick! But how scary was it?